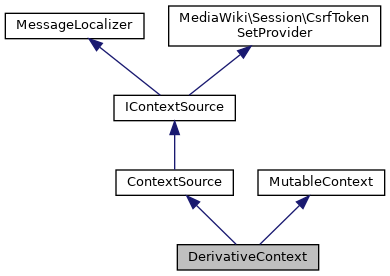 An IContextSource implementation which will inherit context from another source but allow individual pieces of context to be changed locally eg: A ContextSource that can inherit from the main RequestContext but have a different Title instance set on it. Definition at line 30 of file DerivativeContext.php. Definition at line 79 of file DerivativeContext.php. Definition at line 149 of file DerivativeContext.php. References ContextSource\getContext(), null, and title. Definition at line 93 of file DerivativeContext.php. Definition at line 231 of file DerivativeContext.php. Definition at line 192 of file DerivativeContext.php. Definition at line 123 of file DerivativeContext.php. Definition at line 246 of file DerivativeContext.php. Definition at line 102 of file DerivativeContext.php. Definition at line 109 of file DerivativeContext.php. Definition at line 137 of file DerivativeContext.php. Definition at line 206 of file DerivativeContext.php. Definition at line 178 of file DerivativeContext.php. This can't just inherit from ContextSource, since then it would set only the original context, and not take into account any changes. Definition at line 262 of file DerivativeContext.php. Definition at line 86 of file DerivativeContext.php. Definition at line 215 of file DerivativeContext.php. Definition at line 185 of file DerivativeContext.php. Definition at line 116 of file DerivativeContext.php. Definition at line 238 of file DerivativeContext.php. Definition at line 130 of file DerivativeContext.php. Definition at line 199 of file DerivativeContext.php. Referenced by WatchActionTest\testShowUserLoggedInNoException(), and WatchActionTest\testShowUserNotLoggedIn(). Definition at line 165 of file DerivativeContext.php. Definition at line 69 of file DerivativeContext.php. Definition at line 59 of file DerivativeContext.php. Definition at line 49 of file DerivativeContext.php. Definition at line 34 of file DerivativeContext.php. Definition at line 64 of file DerivativeContext.php. Definition at line 74 of file DerivativeContext.php. Definition at line 39 of file DerivativeContext.php. Definition at line 54 of file DerivativeContext.php. Definition at line 44 of file DerivativeContext.php.